Published: Nov. 13, 2016 at 06:24 p.m.
San Francisco 49ers wide receiver Quinton Patton hauls in a career-long 45-yard reception from quarterback Colin Kaepernick. 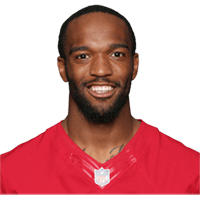 Published: Sept. 13, 2016 at 12:48 a.m.
San Francisco 49ers wide receiver Quinton Patton gains 35 yards on a strike from QB Blaine Gabbert. Published: Aug. 26, 2016 at 10:32 p.m.
San Francisco 49ers QB Blaine Gabbert hits wide receiver Quinton Patton with a 3-yard touchdown pass on the right side. Published: Nov. 8, 2015 at 04:36 p.m.